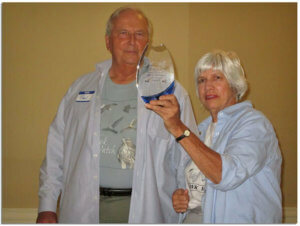 “EMHW honors our Founders Paul & Julie Roberts, 40th Anniversary, since 1976”. Paul and Julie were also presented with a Sponsorship Certificate for the HMANA Hawkcount Homepage, which bears their names. Craig Jackson retired from the EMHW Board after over three decades of service, and he was also awarded with a Sponsorship Certificate for the HMANA Hawkcount “Pinnacle Rock” page. Craig has been the coordinator for that site for many years. 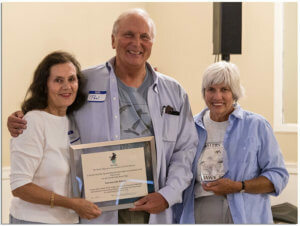 Paul and Julie Roberts, founders of EMHW, presented with HMANA’s Hawkcount sponsorship certificate by Ursula Goodine, EMHW President. 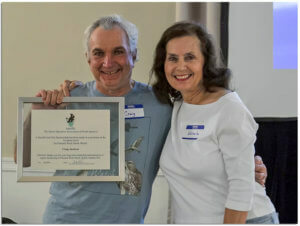 Craig Jackson, retiring EMHW Board member, is presented with HMANA’s Hawkcount sponsorship certificate by Ursula Goodine.